Around 12:45am (Manila time) of April 30, 2010, while I was playing some Facebook games and chatting with my cousin, I felt dizzy. I thought I was just dizzy from looking at the computer. But I was paranoid of about earthquakes, especially after watching the CNN video about Manila being next in line for a major earthquake. So I decided to checked my plurk account, and to my surprise, most of my friends are asking if anyone felt the earthquake. 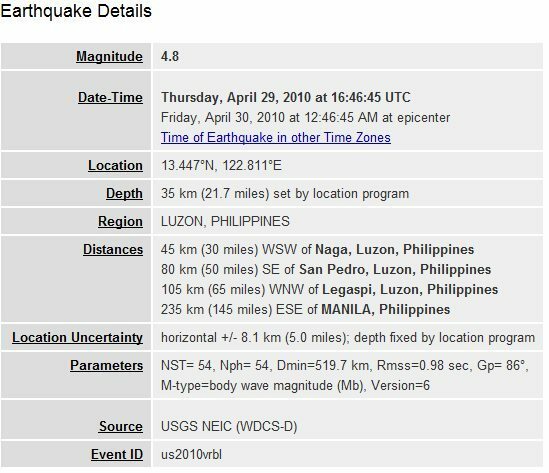 However, as of the moment, there are no reports coming from United States Geological Survey (USGS) and Phivolcs.